The Arizona Diamondbacks and Levy Restaurants have expanded the menu at Chase Field in 2016, including a new Cheeseburger Dog and additional Vegan options for all fans to enjoy. Cheeseburger Dog: Made from char-grilled hamburgers that have been ground up and mixed with chopped smoked bacon, dill pickles, green onion and Cheddar cheese. The “dog” is breaded with milk and seasoned flour, much like our chicken tenders, then deep fried until crispy and served on a hot dog bun topped with more chopped smoked bacon, shredded iceberg lettuce, diced tomato and our house made secret sauce. It will be available for $10.00 at Big Dawgs on the main concourse and Extreme Loaded Dogs on the Diamond Level. Pit Viper Sandwich: Pit-smoked pork, caramelized onions and Yancey’s Fancy Peppadew Cheddar cheese on thick-cut bread, battered and fried until golden with our house made Snake Bite BBQ sauce. It will be available for $20 at Taste of Chase. 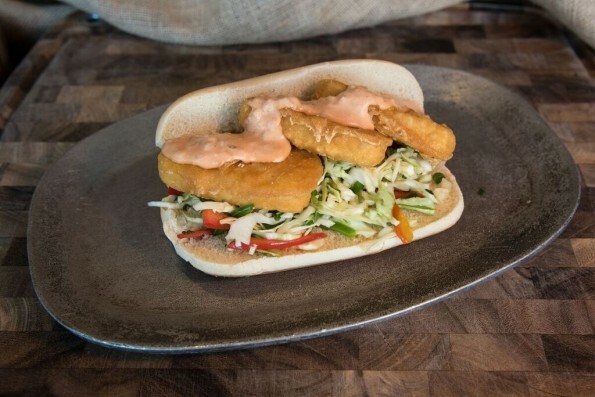 Poor Boy Sandwich (Vegan): Crispy Gardein fishless filet topped with vegan Thousand Island dressing and spicy coleslaw on a soft roll. It will be available for $12.50 on the in-seat menu. Kick’n Chick’n Wrap (Vegan): Grilled Gardein Chick’n, roasted corn, baby spinach, romaine lettuce, “Follow Your Heart” Cheddar cheese, tomatoes, pumpkin seeds, black beans, green onions and chipotle BBQ dressing. It will be available for $8.50 on the in-seat menu. Chile Verde Mac Dog: Topped with green chile mac and pepper jack cheese. It will be available for $10.00 at Big Dawgs. 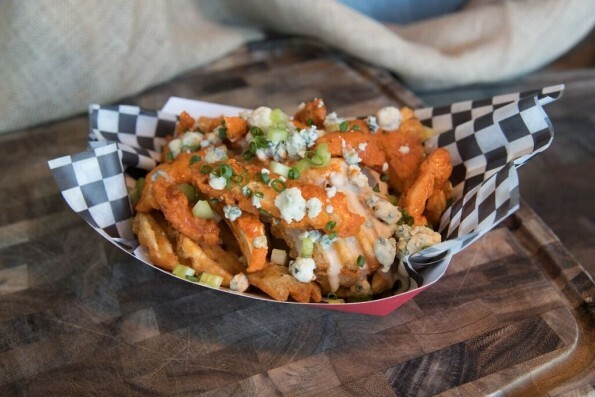 Buffalo Chicken Fries: Waffle cut fries topped with Chihuahua cheese sauce, crispy Buffalo chicken, blue cheese and celery. It will be available for $10.00 at Red Hot Grill stands and Steakout on the Diamond Level. Stuffed Cheeseburger: House-made burger stuffed with Cheddar, provolone and pepper jack cheese topped with crispy onions and beer cheese spread on a pretzel bun. It will be available for $12.00 at Burger Burger on the Diamond Level. Fried Bread Pudding Bites: Served with Jack Daniel’s sauce. It will be available for $8.00 at Extreme Loaded Dogs on the Diamond Level and Big Dawgs on the main concourse. Pepsi Grab ‘N Go – Fans can customize their own flavor of soda at the Pepsi Grab ‘N Go through a new Pepsi Spire machine. Craft Beer – available in the newly-renovated Draft Room and at a Craft Beer portable in which fans can purchase select craft beers in a custom 20 ounce bottle. Roger Clyne’s Mexican Moonshine Tequila Bar – located at two main concourse Cantina Bars and select Margarita tap handles throughout the ballpark. Club Series Wine Bar – newly renovated bar on the Diamond Level that features the D-backs’ Club Series wine. Cocktails on Tap –Doubleheaders locations will feature a variety of cocktails on tap, including margaritas and Moscow mules. Malibu Rum Bars – located on the main and upper concourses. Gluten Free Items – will be served at the Big Dawgs location on the main concourse. 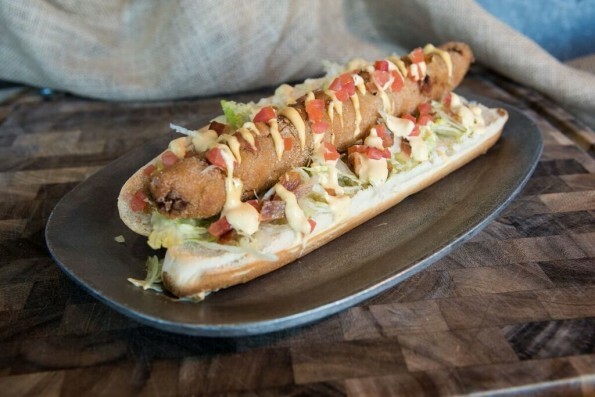 The D-backs will continue to offer fan-favorite items such as the D-bat Dog, Venom Dog and Churro Dog in 2016. All photos were taken by Sarah Sachs and provided by the Arizona Diamondbacks.